A regular breeding resident and migrant, the Indigo Bunting was a common species during the Minnesota Breeding Bird Atlas (MNBBA). The summer breeding range of the Indigo Bunting stretches across southeastern Canada and south throughout the eastern United States, from the eastern Great Plains to the Atlantic and Gulf coasts. Scattered populations are present in the southwest United States. The bunting reaches its highest breeding densities in many of the south-central states, including Missouri, Arkansas, Tennessee, Kentucky, southern Illinois, and southern Indiana (Figure 1). A medium- to long-distance migrant that winters in Central America, the Caribbean, and occasionally in northern South America. An omnivorous diet of insects and seeds. Foraging occurs primarily on the ground but also on the foliage of shrubs and small trees. An open-cup nest usually located within 1 m of the ground and placed within a shrub, small tree, or tall forb, often in a brushy field or a woodland edge or clearing. Breeding distribution and relative abundance of the Indigo Bunting in North America based on the federal Breeding Bird Survey, 2011–2015 (Sauer et al. 2017). Roberts (1932) provides a lengthy description of the distribution of the Indigo Bunting in Minnesota in the late 1800s and early 1900s. He described the bunting as found in nearly all corners of the state and most abundant in the southeast, especially in counties bordering the Mississippi River north as far as the town of Red Wing in Goodhue County. “Farther north it becomes less frequent but has been found along the Red River as far north as Norman and Marshall counties; at Leech Lake, Cass County; in Itasca County; along the north shore of Lake Superior from Duluth to Grand Marais; and in the interior of Cook County.” Although the species had yet to be found in Kittson and Roseau Counties, in the far northwestern corner of the state, documentation of its breeding status in Winnipeg suggested it was, at the least, a rare resident in these counties as well. The bunting could also be found in small woodland groves that dotted the southwestern prairie region. Within the forested counties of north-central and northeastern Minnesota, it was largely restricted to “clearings and burnt-over areas.” Roberts never found it at Itasca State Park even though he spent several summers there. Nesting was confirmed (nests with young or eggs) in Fillmore, Goodhue, Hennepin, Houston, and Wabasha Counties; nesting was inferred (nest and adult carrying food) in Lake and Lake of the Woods Counties. Years later, both Green and Janssen (1975) and Janssen (1987) simply commented that the Indigo Bunting occurred throughout the state but was “most numerous in the southeastern, south-central, east-central, and central regions” (Green and Janssen 1975). Janssen included a statewide distribution map that identified 18 counties where nesting had been confirmed since 1970. Hertzel and Janssen (1998) later added 4 counties to the list. The Minnesota Biological Survey has reported 913 breeding season observations of Indigo Buntings (Minnesota Department of Natural Resources 2016). Although the vast majority of records were in the Eastern Broadleaf Forest Province and in the southern counties of the Laurentian Mixed Forest Province, a surprising number of records were reported along the Minnesota River valley and throughout the southwest corner of the state, where earlier observers reported it as relatively uncommon. No doubt the planting and maturation of many farm shelterbelts contributed to the species’ abundance in the region. During the MNBBA, observers reported 2,590 Indigo Bunting records in 32.9% (1,563/4,756) of the surveyed atlas blocks and in 45.7% (1,068/2,337) of the priority blocks. Breeding evidence was gathered in 67 blocks (Figures 2 and 3; Table 1). The species was found in all 87 Minnesota counties and was confirmed breeding in 38 counties (2 blocks where breeding was confirmed were on the borders of Scott and Dakota Counties and two blocks were on the borders of Scott and Carver Counties). The species remained most abundant in the Eastern Broadleaf Forest Province and in the southern and western regions of the Laurentian Mixed Forest Province. Indigo Buntings were least abundant in northeastern Minnesota, in Koochiching County, and in the far northwestern counties, stretching from Polk to Kittson. The MNBBA predicted distribution map predicts the highest breeding densities occur in scattered pockets in southeastern, south-central, and east-central Minnesota, including along the lower Minnesota River valley (Figure 4). Moderate densities are predicted throughout much of central and southern Minnesota and along the tributaries of the Red River in the northwest. The species is predicted to be absent to rare across northeastern and far north-central Minnesota. In the past 100 years, the breeding distribution of the Indigo Bunting has changed very little in Minnesota. It occurred throughout the northern forest region in Roberts’s time but is likely more common and widespread now that industry, agriculture, and residential development have fragmented the forest landscape from Brainerd north to Duluth, Grand Rapids, and Bemidji. Elsewhere within its breeding range, the species expanded north into Canada, particularly into the Maritime Provinces in the 1970s, and west into California, Arizona, and New Mexico beginning early in the 20th century. During this same time period, it also expanded south along the Florida peninsula (Payne 2006). More recently, states and provinces that have conducted two breeding bird atlases have documented little change in the species’ distribution or abundance. These include Ontario, Michigan, Ohio, and South Dakota (Cadman et al. 2007; Chartier et al. 2013; Drilling et al. 2016; Rodewald et al. 2016). Breeding distribution of the Indigo Bunting in Minnesota based on the Minnesota Breeding Bird Atlas (2009–2013). Summary statistics of records by breeding status category for the Indigo Bunting in Minnesota based on all blocks (each 5 km × 5 km) surveyed during the Minnesota Breeding Bird Atlas (2009–2013). Summary statistics for Indigo Bunting records by breeding status category for all blocks and priority blocks (each 5 km x 5 km) surveyed during the Minnesota Breeding Bird Atlas (2009–2013). Predicted breeding distribution (pairs per 40 hectares) of the Indigo Bunting in Minnesota based on habitat, landscape context, and climate data gathered during the Minnesota Breeding Bird Atlas (2009-2013) using the General Linear Modeling method with an adjustment for detectability. Indigo Buntings are found in a wide variety of open woodland and shrubby habitats, ranging from overgrown fields, roadsides, and brushy pastures to disturbed forests, aspen clear-cuts, forest openings, and woodland edges (Figure 5). The variety of habitats they use during the breeding season is so diverse that it is easier to identify where they are not found: mature forests, intensively cultivated lands, and densely developed urban and suburban areas. Suitable habitat tends to be more xeric then mesic, although the buntings can be found in shrubby lowlands (Payne 2006; Danz et al. 2007). The most important habitat features appear to be sufficient perches for the territorial males and a high density of shrubs or tall forbs for nesting. The National Forest Bird (NFB) Monitoring Program in northern Wisconsin and Minnesota found Indigo Buntings to be most abundant in open, dry habitats, such as young upland clear-cuts, followed by sedge wetlands and small towns (Niemi et al. 2016). Oak forests were the dominant habitat associated with Indigo Buntings on MNBBA point counts (Figure 6). Typical breeding habitat of the Indigo Bunting in Minnesota (© Lee A. Pfannmuller). Habitat profile for the Indigo Bunting based on habitats within 200 m of point counts where the species was present during the Minnesota Breeding Bird Atlas (2009–2013). Statistical analyses using data collected by the federal Breeding Bird Survey (BBS) have generated a North American population estimate of 78 million breeding adults (Rosenberg et al. 2016). The estimate has not changed since 2013, when Minnesota was estimated to support just 0.5% of the continental population, or 400,000 adults (Partners in Flight Science Committee 2013). MNBBA data, however, provided a significantly higher population estimate of 1.85 million adults (95% confidence interval of 1.6 – 3.3 million). Near the northern periphery of the species’ breeding range in Minnesota, Indigo Buntings are far more abundant farther south. An average of 2 to 3 buntings are detected on BBS routes in Minnesota each year. Volunteers in Missouri detect an average of 38 buntings per route; in Tennessee, 55 buntings per route; and in Kentucky, 65 buntings per route. Locally, breeding densities across North America average 14 pairs per 40 ha (Payne 2006). Some of the greatest variability was found in Illinois, where breeding densities ranged from a low of 0.6 pairs per 40 ha to a high of nearly 48 pairs per 40 ha. The highest densities were found in edge and shrub habitats (Graber and Graber 1963). In northern Minnesota, the NFB Monitoring Program documented a forest-wide breeding density of 0.42 pairs per 40 ha on the Chippewa National Forest and 0.08 pairs on the Superior National Forest. The species was most numerous in regenerating conifer stands on the Chippewa National Forest, reaching a breeding density of 3.5 pairs per 40 ha (Niemi et al. 2016). The Indigo Bunting’s population trend is well monitored by the BBS, which covers the species’ entire breeding range. Since the survey began in 1966, the population has experienced a significant annual decline of 0.73% per year through 2015 (Sauer et al. 2017). From 1970 through 2014, Indigo Buntings have experienced a cumulative decline of 25% (Rosenberg et al. 2016). In Minnesota, the population has fluctuated considerably over the years, declining from approximately 1980 through 1990 and stabilizing in subsequent years (Figure 7). Yet, over the entire survey period, from 1967 to 2015, the population has averaged a non-significant annual decline of only 0.15% (Sauer et al. 2017). Interestingly, bunting populations are declining throughout much of the center of the species’ range but are increasing in the two major regions where they have recently expanded: across the northern Great Lakes east to the Maritime Provinces, and in the western interior plains (Figure 8). On the Chippewa National Forest, Indigo Buntings have experienced an annual, nonsignificant decline of 3.98% per year from 1995 to 2016 (Figure 9). A decline in timber harvest activities on the national forest may be responsible for the decline (Niemi et al. 2016). Indigo Buntings were likely a less common species when European settlers first arrived. The dense, mature deciduous forests of eastern North America provided far fewer nesting opportunities for this denizen of open woodlands. But as forests were cleared for timber and agriculture, the open habitat proved ideal for the species. Even as recently as the early 20th century, population densities increased significantly in the heart of the Midwest. A long-term study in Illinois, from 1909 to 1958, documented a 47% increase in bunting numbers (Graber and Graber 1963). Declines documented since 1966 may be due to more intensive agricultural practices that eliminate edge habitats, to increasing urbanization, and in the northeast to the successional loss of old fields to mature forests (Payne 2006). 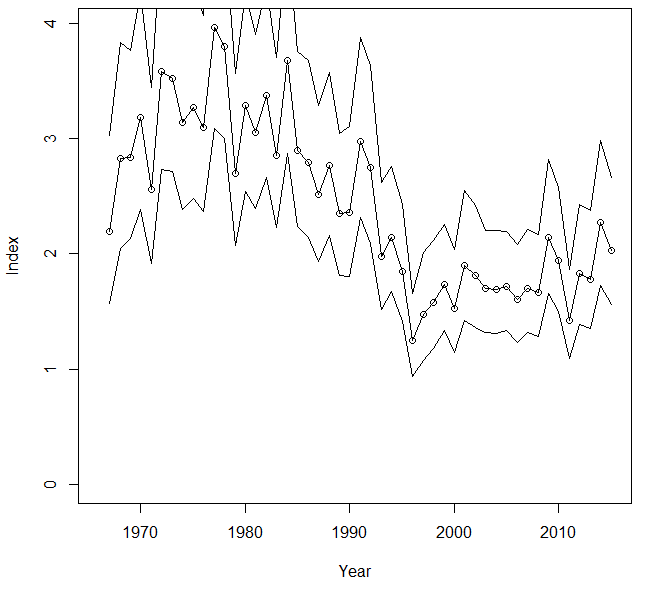 Breeding population trend for the Indigo Bunting in Minnesota from 1967-2015 based on the federal Breeding Bird Survey (Sauer et al. 2017). Breeding population trend map for the Indigo Bunting in North America for 1966–2015 based on federal Breeding Bird Survey data (Sauer et al. 2017). 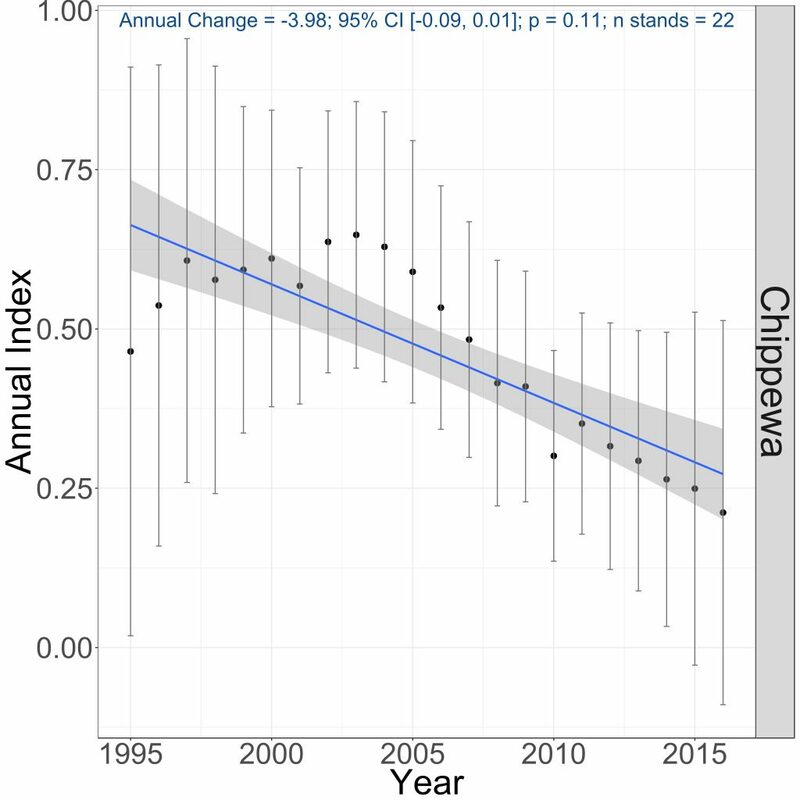 Breeding population trends of the Indigo Bunting in the Chippewa National Forest, 1995–2016 (Bednar et al. 2016). Although populations have been steadily declining in the past 50 years, the Indigo Bunting remains a widespread and abundant species throughout its breeding range. Threats to the population are considered relatively low, resulting in a Continental Concern Score of 9/20 (Rosenberg et al. 2016). The species’ vulnerability to warming temperatures also has been rated as low (North America Bird Conservation Initiative 2010). In the near future, the status of the Indigo Bunting appears quite secure. Graber, Richard R., and Jean W. Graber. 1963. “A Comparative Study of Bird Populations in Illinois, 1906–1909 and 1956–1958.” Illinois Natural History Survey Bulletin, vol. 28.